Importance. -- This insect is common on the oaks, particularly the red oaks, in the East. Trees that sustain repeated attacks are weakened and suffer crown thinning and die-back. Ornamental trees appear especially vulnerable. Identifying the Insect (figure 12a). -- Larvae are slender, yellowish green, and .2 inch (5 mm) long. They often spin down on silken threads when disturbed. Adult moths are small with blackish wings which are marked with paler areas. Identifying the Injury. -- Caterpillars eat the fleshy green part of the lower surface, entirely or in part, which gives the leaves a brownish, skeletonized appearance (figure 12b). 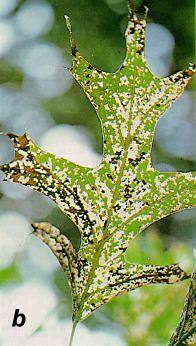 As heavily infested trees are defoliated, the skeletonized leaves drop off and cover the ground. Biology. -- Winter is spent in the pupal stage in white cocoons, about .1 inch (3 mm) long and ridged longitudinally on leaves and trunks. 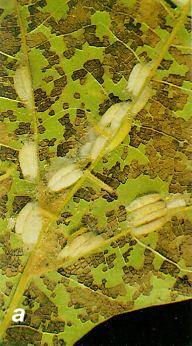 Adults emerge during the spring and deposit eggs on the undersides of fully grown leaves. The youngest (first-instar) larvae enter the leaves to feed, forming tiny mines. Older larvae feed externally. There are two or more generations per year. Control. -- Rake fallen leaves promptly and burn them to destroy cocoons. Insecticides may be necessary on high-value trees. Figure 12. -- (a) Larvae and cocoons of oak skeletonizer on undersurface of leaf; (b) leaf skeletonized by oak skeletonizer.